June 25, 2018 By This post may contain affiliate links. 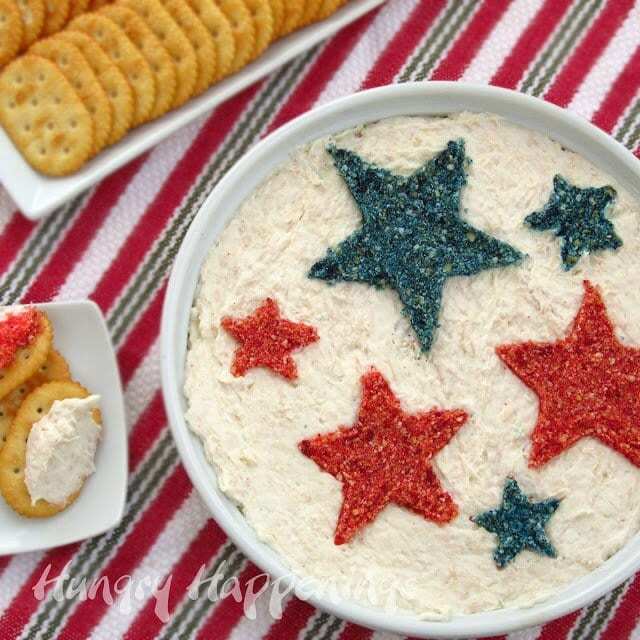 Turn a hot chicken dip into a festive Patriotic Appetizer for your 4th of July party using red and blue colored crackers. 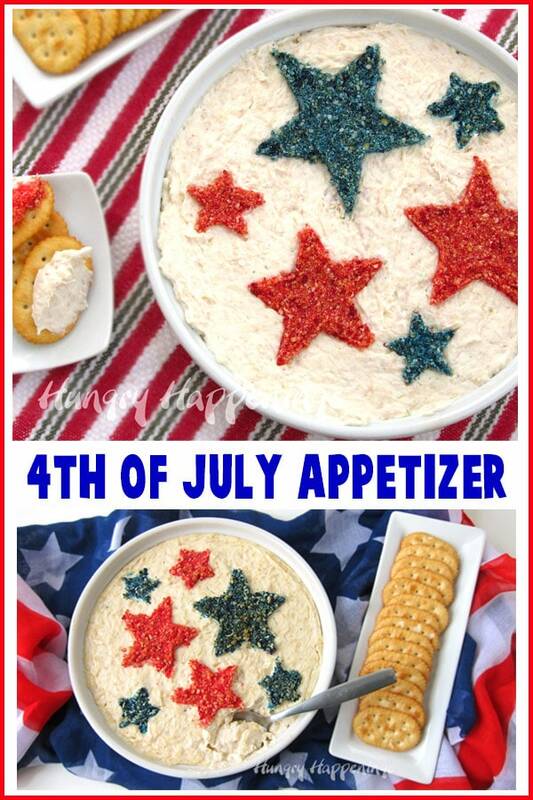 Watch the video tutorial to see how easy it is to make this fun Red, White, and Blue Dip. This post was originally published on June 25, 2012 and updated on June 25, 2018 to include a new video tutorial. Last week I discovered just how easy it is to add color to crumbs. After I created a blue cookie crust for my Red, White and Blue Cheesecakes, I decided to try coloring other crumbs and creating festive ways to use them. My first experiment included Town House Crackers which are very pale in color and were easy to color. 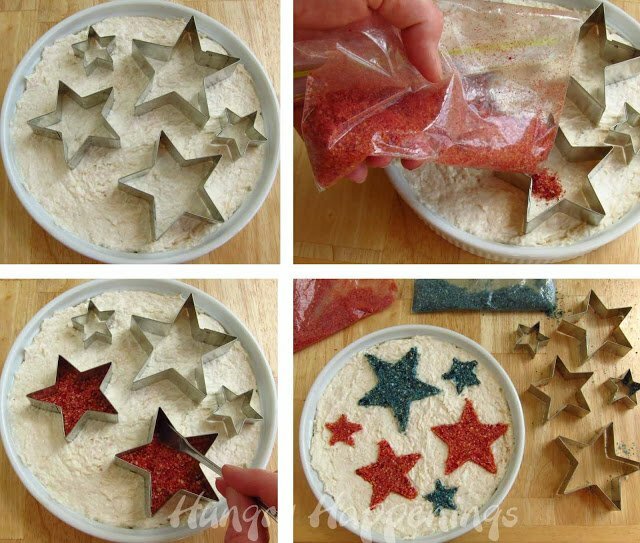 With 4th of July coming up next week, I decided to create something patriotic, so I colored my crumbs red and blue and sprinkled them into star shaped cookie cutters over a cream colored dip. I made my favorite chicken dip to use as the background for my stars, but thought these colorful stars would look great on top of homemade macaroni and cheese or even potato salad if you want to decorate some picnic food. 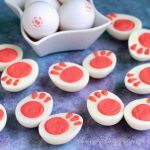 This project took me about 15 minutes of prep time so it’s perfect if you are short on time but want something that will really wow your party guests. It tastes great served cold too so it’s a great dish to take along to a party. 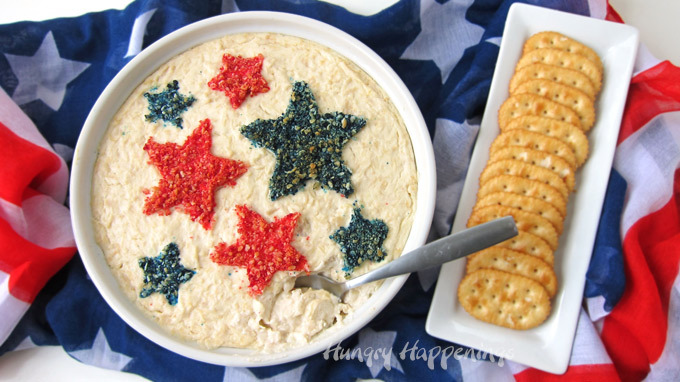 Watch this video tutorial to see how you can make this hot chicken Patriotic Dip as an Appetizer for your 4th of July party. Hot chicken dip topped with red and blue colored cracker stars makes a fun appetizer for the 4th of July. Beat in Miracle Whip, lemon juice, Worcestershire sauce and chicken until well combined. Spread into a shallow 8 or 9 inch round baking dish. Divide into two small zip top bags. Add 5 drops of red coloring into one bag and shake the bake and knead the color into the crumbs, adding more color until you get a nice vibrant red. 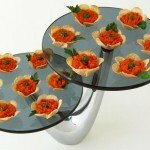 Arrange a variety of star shaped cookies cutters on top of the chicken dip. Sprinkle the colored cookie crumbs inside the walls of each cookie cutter, making some blue and some red. Bake for about 15 minutes, just until the dip is hot. Remove and serve immediately with crackers. If you want to make the dip ahead of time, refrigerate the decorated dip for up to several hours. Heat in the oven just before serving. You can alternatively heat the chicken dip in the microwave on high for 2-3 minutes until hot. Use about 6 pale colored crackers like Town House or Club Crackers. 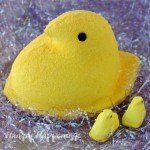 Crush them either using a small food processor or by placing them in a zip top bag and rolling over them with a rolling pin. Equally divide the crackers into two small zip top bags. Add some red liquid food coloring into one bag and blue into the other. Shake the bag a few times then use your fingers on the outside of the bag to knead the color into the crackers. Set assorted star shaped cookie cutters over the dip. Snip a small opening in the end of the zip top bag that is filled with the red crumbs. Shake crumbs into the center of the star cutter. Use something like the handle of a spoon to spread the crumbs in a very thin and even layer in the star. If you over fill your cutter, once you remove it your stars will lose their shape. Fill some stars with red and others with blue colored crumbs. You can decorate this dip up to a few hours before your party then bake it once your party guests arrive. Bake just to heat the dip through. You can microwave the dip, but you won’t be able to stir it, so it may heat a bit unevenly. You can also serve this dip cold, if you prefer. It’s great that way too. I hope you and your 4th of July party guests enjoy this festive Red, White, and Blue appetizer. 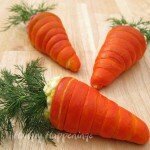 If you like this recipe you might also enjoy making other fun foods for your July fourth celebration. 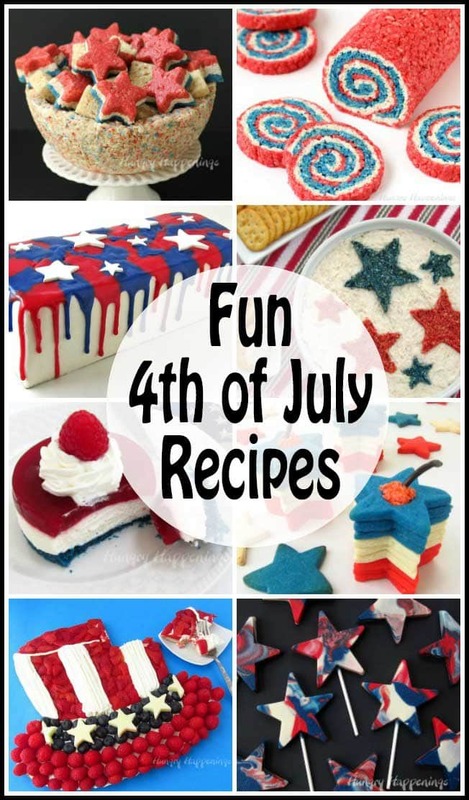 Click this link to see more 4th of July Recipes. Previous Post: « Cookies & Cream Milkshakes – MOOShakes! What a great idea- so festive! Love the idea with the stars! How cute! Fabulous! Had to pin this one! Love it Beth, who knew cracker crumbs could be colored so easily… I had an idea to add food coloring to graham cracker crumbs for a colored pie/cheesecake crust, but never thought of crackers! Very clever! Great idea to use the cracker crumbs! Very clever Beth! I bet you could also crush red and blue chips! Love it! Thanks Jill. I've used blue corn tortilla chips for some Halloween recipes. They look black, but if you can find red and blue chips for the 4th, I'm betting the blue will be colored blue and should look blue when crushed. I haven't seen any this year at my grocery stores. you are really talented…this is something that anyone can pull off and that is what makes you so awesome!! That's an excellent idea and really works with the dip! so fun and the possibilities are endless. Hi there! I just wanted to let you know I featured you in my Fourth of July Round up. Stop by and check it out and snag a featured button. Thanks so much Danielle! 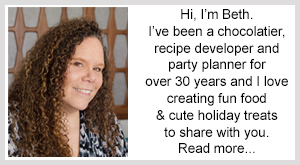 I appreciate the feature and will grab a button to add to my Featured On page. Awesome idea! Do you think for the chicken dip you could substitute salmon? Love it, thanks for the idea! Absolutely. Crab would work too. Just adjust the other ingredients according to your taste. Great idea… Congratulations on your firsr feature!! Happy Crafting. 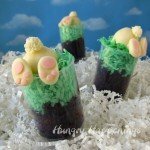 Seriously awesome idea – and so tasty! 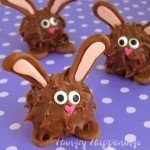 And, what's awesome is you could totally make this for any occasion with different shapes – perfect! What an ingenious idea! I'm pinning this. 🙂 Thanks for sharing. oh man, awesome idea! i never thought to color crackers, thanks so much for sharing! !